Can a robot have a better bedside manner than a doctor? Perhaps. But a humanoid robot packed with the latest technology can certainly spend more time with a child in the hospital, become his or her confidant and utilize technological abilities that exceed humans. Those were the findings of a fall-semester class at the Center for Design Research (CDR) of the University of Kansas School of Architecture & Design. The class was the latest research project in a long-running collaboration between the CDR and Overland Park-based Sprint. SoftBank Robotics, an arm of Sprint’s Tokyo-based parent company, SoftBank Group Corp., loaned the robots to the CDR for the project. The idea, CDR Director and Design Professor Greg Thomas explained, was to explore the innate capabilities of the robot – e.g., facial and speech recognition, movement, data capture – in a pediatric health care setting. 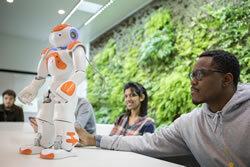 NAO and Pepper robots from SoftBank Robotics are used to assist people in retail, hospitality, banking and health care. For this particular project, Thomas wanted his students to see how NAO might be used to improve outcomes for patients at Children’s Mercy Hospital (CMH) in Kansas City, Missouri. The class is an extension of his previous work with technology applications in health care design.